Become your own FM radio station with this fully assembled Free Radio Berkeley Mono 150 watt FM Broadcast Transmitter. 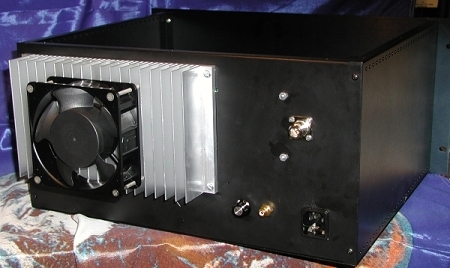 Designed to work on a continual basis under less then ideal conditions and housed in an 8 X 10 inch aluminum enclosure with a heat sink for the amplifier section. This includes the PLL Exciter, Amplifier, Voltage Regulator, Harmonic Filter, and an external AC to 13.8 volt DC power supply. Stand-alone box enclosure unit available here. An optional power meter is available for monitoring output power for $95. A 5/8 Comet ground plane antenna tuned to the frequency of your choice is available for $125 here along with LMR400 type coaxial cable in lengths of 50 or 75 feet. With an antenna and an audio source of your choosing, you'll be ready to broadcast in no time! Please contact us for international shipping prices or detailed specs.